20.1.2018 I’m starting my own religion. I’m calling it Mathology. Sheldon Cooper: You said he didn't create the sun until day four. Sheldon Cooper: So how could there be light the first three days? 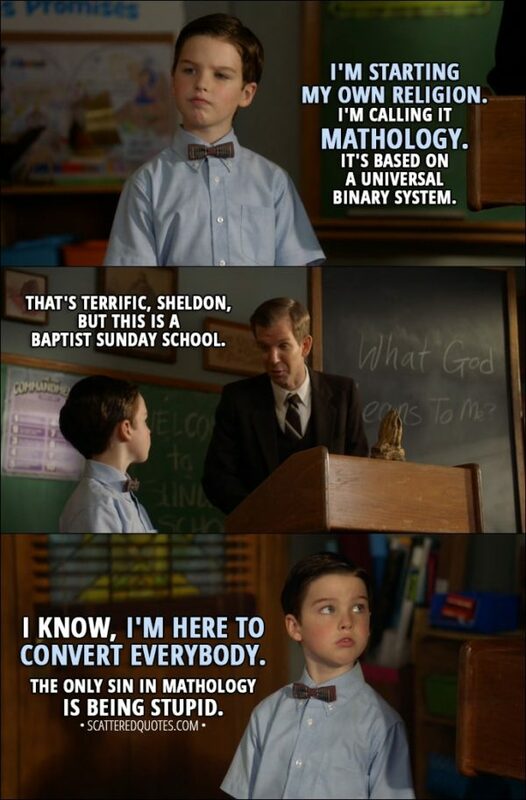 Sheldon Cooper: So God's a photon? Pastor Jeff: God's what made photons possible. Sheldon Cooper: And what day did he do that? Pastor Jeff: I would think day one. Sheldon Cooper: How could you count the days...? George Cooper Sr. (whispering to Mary): If I grab my chest and keel over, maybe we can get out of here. Mary Cooper: That's a terrible thing to say. Pastor Jeff: ...because the first day had just begun. Sheldon Cooper: So, before the Big Bang? Pastor Jeff: There was no Big Bang. There was only the Word. Sheldon Cooper: Was the word "kaboom"? 30.12.2017 God is light. – So God’s a photon?